A controversial painting removed from display at the U.S. Capitol will not be returning to display after the U.S. District Court denied a request for an injunction before the exhibition in question came to an end. 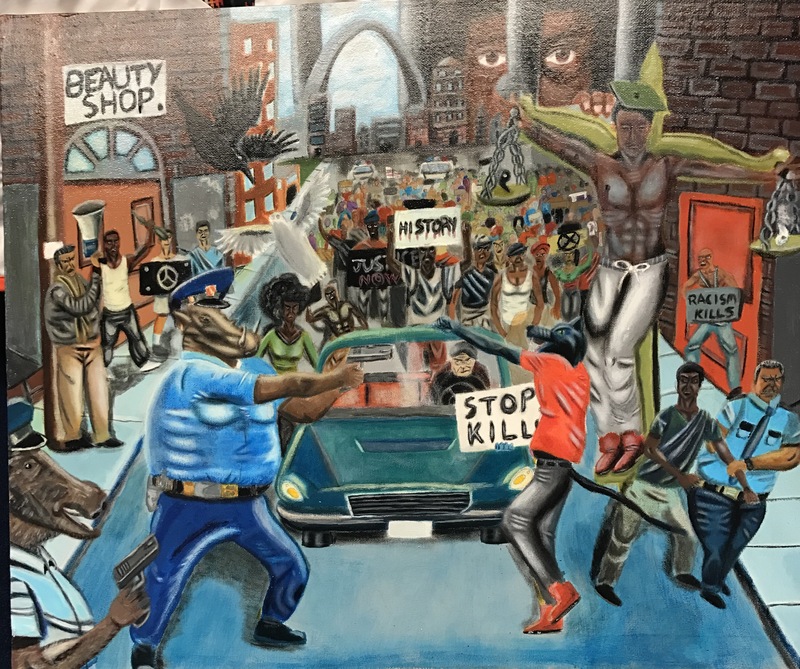 While the court acknowledged that St. Louis teenager David Pulphus’s Untitled #1 had been removed based on its viewpoint, it ultimately held that Pulphus was not the one “speaking,” the government was. As such, it was free to do as it wished. The court’s opinion carefully considered the factors that determine whether the speaker is the government or a private citizen, but as it acknowledged, the line can be hard to draw. The opinion has implicationsfor other cases where art in public spaces stirs controversy. Topics: Wm. Lacy Clay (D-MO), First Amendment, Ferguson Missouri, St. Louis, Dave Reichert, Duncan Hunter, David Pulphus, public forum, government speech, Thomas P. (“Tip”) O’Neill, Jr.
For several weeks earlier this year, an odd battle was waged in the halls of the U.S. Capitol over a controversial work of art by a high school student placed there after an art competition in St. Louis. At issue is whether the Architect of the Capitol had the right to direct the permanent removal of the painting, or whether doing so violated the student’s (or his Congressman's) First Amendment Rights. That student, and the Congressman, have now gone to U.S. District Court in Washington, DC to get an answer. As in the past, strong feelings on all sides about police officers in particular have sharpened the debate about how, when, and whether the government can be selective in its displays of expressive visual art. With that said, the ostensibly retroactive application of Capitol rules to disqualify a painting that had previously passed those very same guidelines seems unlikely to pass First Amendment muster.